Assemble at Singapore Changi Airport for your flight to Osaka via Narita/Haneda. Your visit to the region of Kansai will kick off on a regal note with a visit to Osaka Castle, one of the most famous sights in the city. Surrounded by a sprawling verdant park, this majestic historical relic affords a vast panoramic view of the entire city. Then, spend the afternoon at Shinsaibashi Shopping Street, a shopper’s paradise with a history of almost 400 years. Proceed to your hotel to rest your tired feet, deposit your shopping bags and retire for the evening. After breakfast, make a stop at one of the city’s cultural legacies, Kiyomizu-dera Temple. This distinctive Kyoto landmark features a wooden veranda that hangs over the valley, providing a stunning view of the city with more than a thousand years of history. Next, take a leisurely drive to Kanazawa. Visit Kenrokuen Garden, hailed by many as one of Japan’s three most beautiful landscape gardens. The spacious grounds, captivating flowering trees, peaceful water features and picturesque teahouses are perfect for finding that elusive inner peace. This morning, unleash the inner heritage buff in you at Shirakawa-go, a well-preserved UNESCO World Heritage site featuring quaint farmhouses with distinctive steep roofs that resemble clasped hands in prayer. Next, explore the charming Takayama town with its buildings and streets dating back to the Edo period when it flourished as a wealthy merchant town. Stroll past sake breweries and rows of merchant houses adorned with lattice bay windows and pick up unique Hida souvenirs and confectionary along the way. In the evening, enjoy a relaxing beauty bath at an onsen resort in Nagano. Start the day by visiting the Shiraito Falls, recognised as one of Japan’s 100 Greatest Waterfalls. The 150 metre wide cascade flows off the edge of a 20 metre high cliff in thin white streams that resemble hanging threads of silk. Next, let Karuizawa, Japan’s leading summer resort town at the foot of the magnificent active volcano Mount Asama take your breath away with refreshing forest air, many larch and white birch trees, restaurants, coffee shops, boutiques and fashion goods shops stand side by side. Browse the town’s main shopping strip, the Karuizawa Ginza shopping street and Karuizawa Prince Shopping Plaza where you can pick up souvenirs, try local desserts or simply soak up the laidback and romantic ambience. Thereafter, proceed to Kasatsu, a small town that boasts the largest volume of flowing water among all the hot springs in Japan. Be sure to explore the two bathing styles unique to the Kasatsu tradition, Jikan-yu and Yumomi. 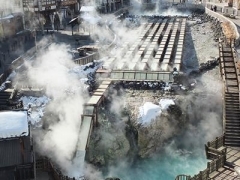 Enjoy a traditional Yumomi performance in Yubatake this morning to witness traditional method of cooling down hot spring water to bathing temperature by stirring the water with large wooden paddles. The process is accompanied by the singing of a local folk song and folklore dance. Next, take a stroll thru Onioshidashi Park in Tsumagoi, a natural garden formed by lava and rock of the eruption of Mt. Asama. Unleash the inner heritage buff in you at Kawagoe, much overwhelmed by locals with its well-preserved little edo town with rows of magnificent merchants' houses in the traditional storehouse-style stand side-by-side. There are shops selling Japanese candies, sweet potato cakes, rice crackers, and other snacks stand in a row on both sides of the stone-paved lane. Their simple, nostalgic taste will satisfy both your tongue and heart. End the day with a leisure drive to cool urban, neon-lit buzz of sleek and efficient Tokyo. After breakfast, spend the rest of the day at your leisure. Take your pick from the maze of contrasting yet complementary neighbourhoods in this dynamic city – the towering skyscrapers in Shinjuku, vibrant youth subcultures at Shibuya and Harajuku, or the polished bling of Ginza. Tokyo never fails to surprise, intrigue and delight! Alternatively, join an optional tour and say hello to Mickey at Tokyo Disneyland or DisneySea at your own expense. If time permits, you can do some last-minute shopping before you transfer to airport for your flight home.